Gardeners love Christmas too! Sometimes, it can be difficult to know what to give a gardener though - not that we are picky! - it’s just that there is such a huge range of interests within gardening. If you want to browse a huge range of gifts, use the links on the left. If you need some quick gift ideas that are sure to please any gardener, try those below. This is the tree that we recommend if you are new to bonsai. 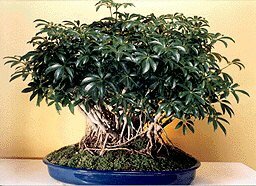 It is one of the easiest bonsai trees to care for and is a very beautiful "trouble-free" evergreen. If you don't know which tree to purchase as a gift for someone, this is the tree to select. It is great for home, office, dorm or anywhere and does well in low to high lighting conditions. The tree features tiny umbrella shaped leaves forming a dense green canopy. Very popular and easy indoor care. This Hawaiian Umbrella Tree extra large bonsai with banyan roots is truly a magnificent work of art by mother nature. Anyone would be proud to own this impressive conversation piece. 15 years old 14"-20" tall. Gift Certificate - Choose denomination at check out. Finding the perfect gift can be difficult, but a Bonsaiboy.com gift certificate takes the guess work out of pleasing even a gardener! Allow the recipient to choose from the extensive selection of bonsai trees, tools and accessories. The Double Cut Pruners have one piece composite molded handles for comfort and a large 8 1/4 inch length and a 1 5/8 inch cutting edge to make cutting easier. This unique wind chime is handcrafted, weatherproof, and volume-adjustable! An adjustable bead is located under the wooden ball that easily slides to increase or decrease the music volume. The beautifully finished hand-bent rust-proof pink metal frame and notes are made of anodized aircraft-grade aluminum to insure the metal's appearance, tonal quality, and musical pleasure for a lifetime! This unique wind chime is handcrafted, weatherproof, and volume-adjustable! An adjustable bead is located under the wooden ball that easily slides to increase or decrease the music volume. The beautifully finished hand-bent rust-proof metal frame and rainbow notes are made of anodized aircraft-grade aluminum to insure the metal's appearance, tonal quality, and musical pleasure for a lifetime! Does your garden need a little personality? Just invite "Bob" and all his feathered friends! Made from weatherproof high-fired ceramic stoneware, this unique birdfeeder will never fade or discolor. He is suitable for all seed types and ready to hang. Handcrafted in Missouri, "Bob" is an example of functional garden art at its' best! This whimsical bird feeder depicts the legendary 'Green Man' of English lore in a joyful mood as he provides food for his feathered friends. Created by ceramic artisans in Maine from high-fired stoneware, he is weatherproof and will never fade or discolor. His tongue acts as the perfectly-sized perch for small birds. This sleek birdfeeder is stylishly poised and beautifully accents any garden. Seed is dispensed directly from the mouth as the tongue acts as the perfect-sized perch for small birds. Made from weatherproof high-fired stoneware by ceramic artisans in Maine, this unique birdfeeder is suitable for all seed types and is ready to hang. Includes rubber stopper and braided metal cable. Choose from two colors: "chocolate" or "honey"! Meticulously handcrafted in the foothills of northern Georgia, these cedar birdhouses are superbly functional. Suitable for a bluebird, tufted titmouse, or bird of similar size, the birdhouse has a 1.5" entry hole with a copper ring. The birdhouse is topped with a hand-hammered copper roofing and has a backdoor for easy cleaning. The lightweight wooden bracket makes it suitable for mounting to a wall, fence post, or any outdoor structure. No assembly required. Handcrafted in a small coastal Maine foundry, each piece of this wind bell is cast in bronze using the ancient techniques of sand-casting. The metal is durable, withstands the harshest of weather conditions, is highly resistant to corrosion, and rings with a strong, pure tone that is unique to bronze. Fully assembled with a mahogany clapper and ready to hang. Lifetime guarantee included. Handcrafted in the USA, this unique birdfeeder consists of swirled solid copper fused together to create a functional work of contemporary garden art! Two interlocked "swirls" create a tray for the birdseed as well as an overhead baffle to shelter the seeds and birds. This elegant design will last a lifetime while developing a natural green patina. Includes an attached copper hanger. Handcrafted in the USA, this unique birdfeeder and bath consist of swirled solid copper fused together to create sculptural works of functional garden art! Two interlocked "swirls" on the birdfeeder create a tray for the birdseed as well as an overhead baffle to shelter the seeds and birds. The birdbath design is inverted so that the larger "swirl" creates a solid tray suitable for bathing. The elegant designs perfectly compliment each other and will last a lifetime while developing natural green patinas. Each includes an attached copper hanger. Designer Jeff Davis has put a new spin on recycling by rescuing unwanted records and creating them into fascinating works of functional art. These unbelievable bowls are made from actual 12" vinyl records and are perfect for fruit, dry snacks, or upbeat decoration! Each bowl has the original label intact and protected with a clear mylar seal. Choose from several genres including rock essentials, country, and divas... each consisting of well known music artists. Slate & Metal Business Card Holder - "Moose"
Created from all-natural materials, the sturdy moose silhouette and mountaintop background are finely cut in metal with a warm patina finish and mounted atop a heavy slate base with cork pads. This durable desk accessory makes a wonderfully unique gift. Made in the USA. Slate & Metal Business Card Holder - "Cowboy"
Created from all-natural materials, the sturdy cowboy/horse silhouette and mountaintop background are finely cut in metal with a warm patina finish and mounted atop a heavy slate base with cork pads. This durable desk accessory makes a wonderfully unique gift. Made in the USA. Slate & Metal Business Card Holder - "Fisherman"
Created from all-natural materials, the sturdy fisherman silhouette and mountaintop background are finely cut in metal with a warm patina finish and mounted atop a heavy slate base with cork pads. This durable desk accessory makes a wonderfully unique gift. Made in the USA. Metal & Sandstone Desk Set - "Moose"
Created from all-natural materials, the sturdy moose silhouette and mountaintop backdrop are finely cut in metal with a warm patina finish and mounted atop a heavy slate base with cork pads. This durable set includes (1) letter/mail holder and (1) business card holder. Handcrafted in the USA.